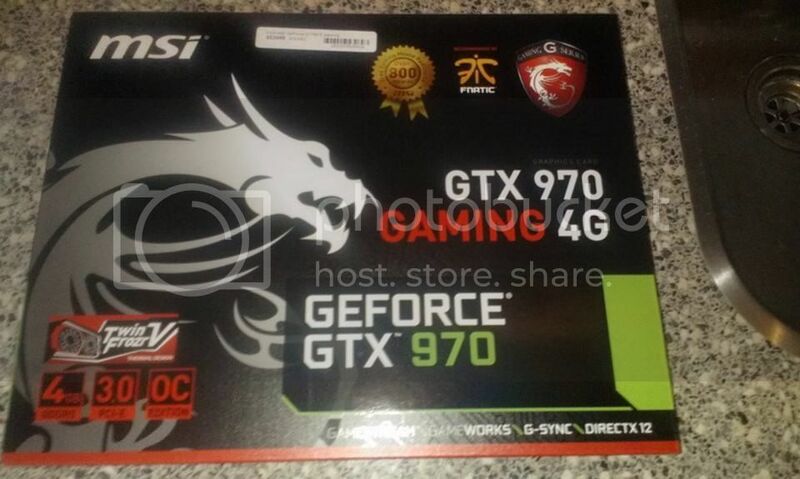 A few days ago i bought the msi gtx 970 gaming card, The reason why i bought the msi is? 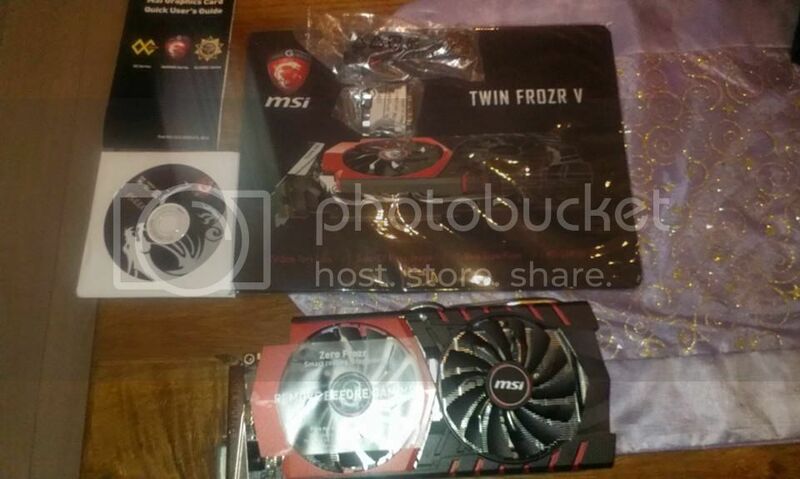 2 - my other msi cards i had before where a great cards. 4 - AND this was the only 1 in stock. The card comes in a nice box with a nice mouse pad with it. Oke now it was the time to plug it in and do some tests. 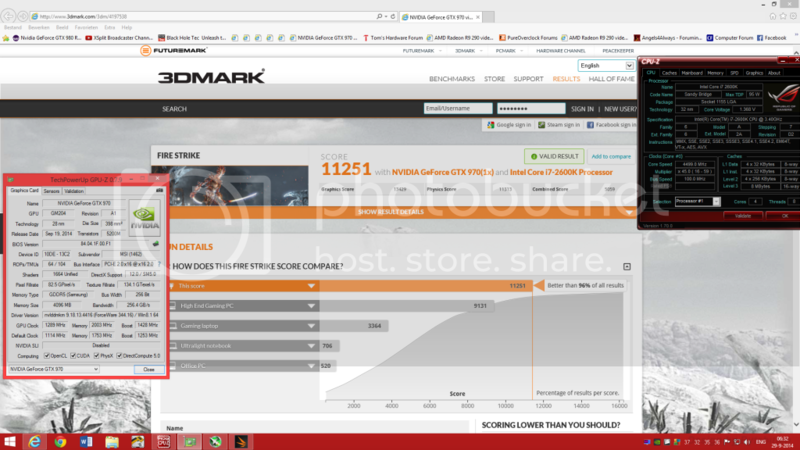 the first test that i did was firestrike with the cpu at 4.4ghz And the card at stock. After that i tryed to see what it would do in overclock but because it was late i diddent see wat the max was, but just a quick overclock. These are the settings that is set in msi afterburner. 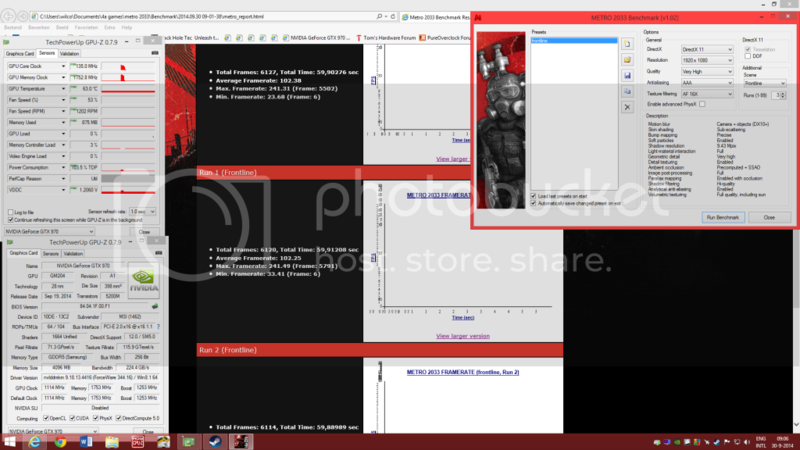 And i set the cpu to 4.5ghz and run firestrike again. after a bit of playing around with the card and switching to 3d mark 11, because firestrike takes for ever if you can not run it with out demo included. I came to my 3d mark 11 stable overclock. fan speed manual set to 70% AND yes still very, very Quit. 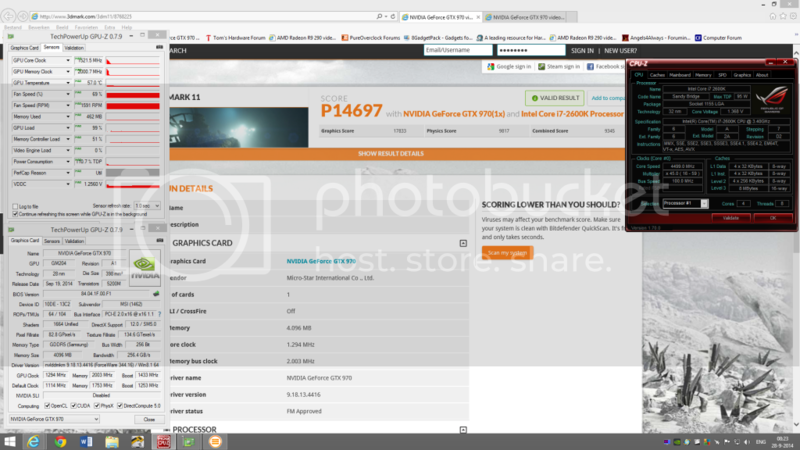 So i hope i maybe could help somebody who is still deciding on witch gtx 970 to buy. Msi would be a great choice. WOW Good score's. MSI make's a good product. Thank's for sharing. The colors on this card are a perfect match for my MSI Z87 Gaming G45 Motherboard. Considering the numbers that you're posting in benchmarks in a few threads, Maybe these are what I'll be buying to use on it. NVIDIA is seriously whacking AMD's cool with these two new offerings (GTX-970 & GTX-980) at such low price points. Their performance is outstanding for the money spent. NVIDIA is definitely on the upside right now. They just introduced two good cards at a great price point, and that has to hurt AMD's plans ahead of the next launch that they're planning. If AMD has any wiggle room for lower prices in the future, they should use that to try to counter Team Green's onslaught. AMD's offerings are plenty fast enough for most of us if the prices are looking good. 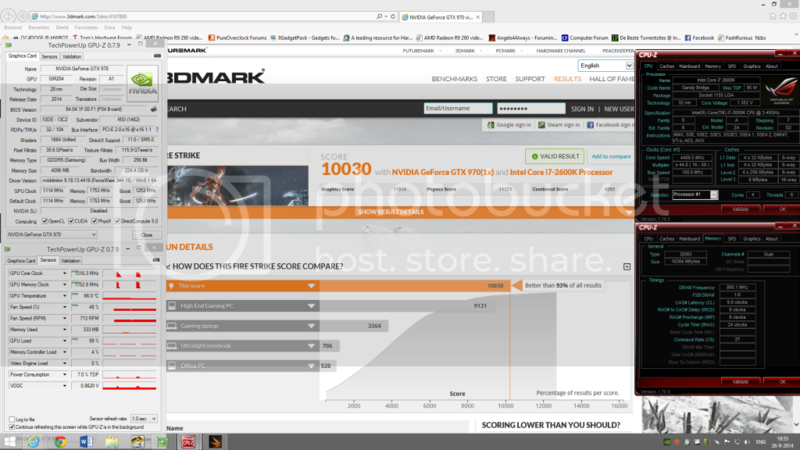 I love my pair of R9-280X OC cards in Crossfire. Graphics processors seem to be advancing at a rate that games can’t keep up with. This translates to: “we don’t need the best that there is available, to play modern games”. SLI and Crossfire technology only make it easier to stay ~in the game~ at a reduced cost. These levels of performance at lower prices are ~essential~ for some of us that cannot afford to buy new GPUs all of the time. We can still play games at great frame rates with a lot of 'Eye-Candy' turned on. It’s a good time to be a gamer. Last edited by realneil; 29-09-2014 at 16:49. Thanks for sharing bro. Good scores. Enjoy that card. Oke some more updates about this card. Like i read on some sites have a few people problems with the msi card, but when people have problems the talk about it, if there are no problems then there is no need to talk. I like mine very muchand have no problems with fans stopping, spinning at 100% or coil wine. i rune a couple of test, with fan control from msi afterburner, and i tried the gaming app, all works fine.here are some updated benchmark scores. 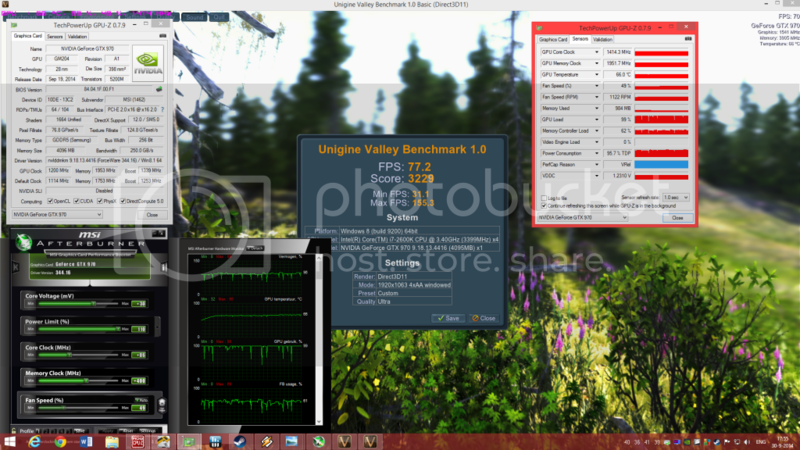 not the max overclock, but my 24/7 overclock used in unigine valley. 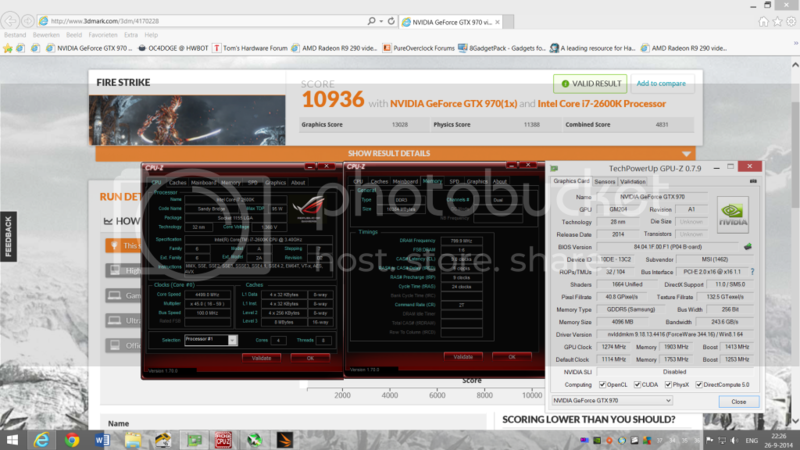 As you can see the graphics score is 13429 points, compare that to 2 x msi gtx power edition at stock, the scored 14460 points so this card is almost as fast as 2 of the gtx 670 cards, very impressive. Good Score. Great GPU, enjoy it.